There’s a resort in Japan called Unkai Terrace, located on a mountain peak from where you can see a sea of clouds floating below you! Located in Japan’s Tomamu Resort, on the island of Hokkaido, the Unkai Terrace is a unique scenic spot perched high atop a mountain peak that is often above the clouds, offering tourists breathtaking views of the white, fluffy sea beneath them. It may seem for cloud tops to overlap and to be filled with clouds to the horizon. Such a state is called sea of clouds. This Unkai terrace is located in a small town called Tomamu. and the mountains in Hidaka and Tokachi can be enjoyed. Many people gather from the world to experience this unusual world. There being a cafe in this place and looking at a sea of clouds and can eat a light meal and soup. You must have one of those “must see before I die” lists… If you don’t, we strongly suggest that you make one and put Unkai Terrace in the Japanese resort of Tomamu on it. Why? Because the words “amazing”, “breathtaking”, “stunning”, “fantastical” come to mind when you step foot on this terrace. In order to do that, you will need to take a cable car and once you get there you will witness one of the nature’s rarities – Unkai (in English ‘sea of clouds’). There is also a spectacular view of the Hidaka-Tokachi mountain range. The Alpha Resort Tomamu is located in Shimukappu village, in Hokkaido, and has quickly become a new tourist hotspot. 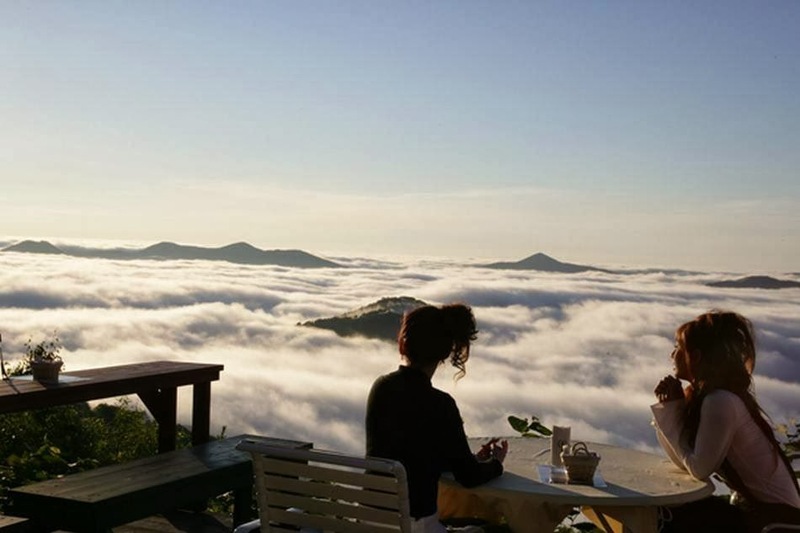 Unkai (sea of clouds) can be seen only from specific locations and in special weather conditions, and the terrace in the Tomamu Resort (located 1,100m high up the mountain) is the perfect place for Unkai watching. The best time of the day to see Unkai is morning, and once you get to the terrace by a gondola, you will literally be above clouds. You will be able to enjoy a panoramic view like no other! Interestingly enough, your ticket to Unkai Terrace also doubles as a postcard which you can mail directly from the summit. There is also the Tenbo Café where you can have a warm cup of tea or coffee while you gaze at the fantastic natural phenomenon called Unkai. the fastest growing trees in the world. Hamilton Pool, near Austin, Texas. House in Germany, identical like Flinstons home! Our selfie of the day! Times Square, then and now! This is all one photo! AMAZING! Queen Mary 2 and it's captain! Great White Shark and Kayak, South African Bay! Fire rainbow in the sky! If planet Earth had rings like Saturn! Amazing Realistic Painting By Joel Rea!